The Thracians were skillful craftsmen. They made beautifully decorated gold and silver objects such as various kinds of vessels, rhytons, masks, pectorals, ornaments and weapons. They used to bury rich hoards of precious objects to hide them in times of enemy invasions and unrest as well as for ritual purposes. To date, more than 80 Thracian treasures have been excavated or, more often than not, accidentally found in Bulgaria. The Varna Chalcolithic Necropolis has been defined by experts as “the world’s oldest worked gold”, dating back to the 5th millennium BC, and as a site offering a unique insight into “Europe’s most ancient civilization”. Found by accident by workers digging a trench near the Varna Lake in 1974, it is arguably the richest necropolis in Europe from the Late Chalcolithic. It was built by an unknown civilization that existed on this territory at that time, provisionally called “Varna culture”. The treasure consists of 28 articles: bracelets, sash decorations, vessels. It is on view at the Museum of History in Varna. The Panagyurishte Gold Treasure (4th century BC) was found by accident in 1949 two kilometres south of the town of the same name. 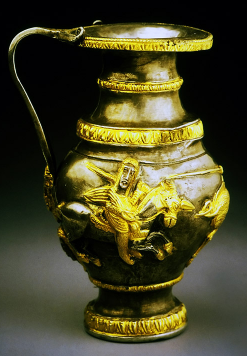 It consists of nine pieces made of 23-carat gold: rhytons, amphorae, trays with engraved mythical scenes. They are very beautiful, with rich decorations and ornaments. The items of the treasure form a rich and expensive gold set of great artistic value. They had ritual functions. The treasure is kept at the National Museum of History in Sofia. The Valchitrun Gold Treasure was discovered in 1924 by two brothers ploughing their field near the village of Valchitran, Pleven district. It is the biggest gold treasure found in Bulgaria to date – 12.50 kg of solid gold with natural alloys of silver, copper and iron. The treasure dates back to the end of the Bronze Age (16th-12th century BC). It consists of 13 perfectly shaped ritual pieces. One of the fascinating aspects of the treasure is that it contains small cups made in such a way that they can stand only when filled with liquid. The treasure is on view at the Archaeological Museum in Sofia. Gold Mask of a Thracian king. This is a 2 400-year-old gold mask that was probably made for a Thracian king’s funeral. The mask depicts a full face with moustaches and a beard. The rare artifact is made of 600 grammes of solid gold and has been described as having “no parallel in archaeology”. It was unearthed by archaeologists in 2004 near the village of Shipka, in the so-called Valley of the Thracian Kings. The mask may have belonged to Seuthes III, a Thracian king who ruled in the 5th century BC. Besides the mask, archaeologists also found a gold ring depicting a rower, and many bronze and silver vessels. These are only some of the many treasures discovered on the territory of present-day Bulgaria, inhabited by ancient civilizations thousands of years ago. Gold objects and treasures have also been found in many other places in Bulgaria, such as Borovo, Lukovit, Vratsa, Letnitsa and Mount Strandzha. Priceless works of art, these treasures are a testament to the superb craftsmanship of the ancients as well as to their striving after beauty and harmony.